Assembling the piping and valves for stimulation is no small task. The heavy-duty piping delivers high-pressure water to the wellbore during stimulation. Last night, we started to cool the with low-flow cold water injection. After the wellbore is sufficiently cooled, we’ll install a distributed temperature sensing (DTS) fiber optic cable in the well. 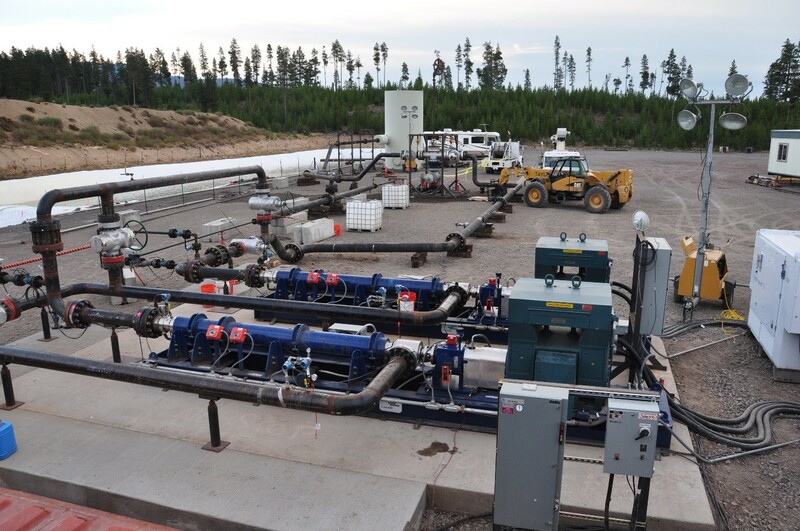 The cable provides real-time temperature data along the wellbore and is used in stimulation zone analysis. Panoramic view of East Lake from the boat launch area. We’ll continue to collect water samples at the East Lake hot springs and other sites over the coming months. 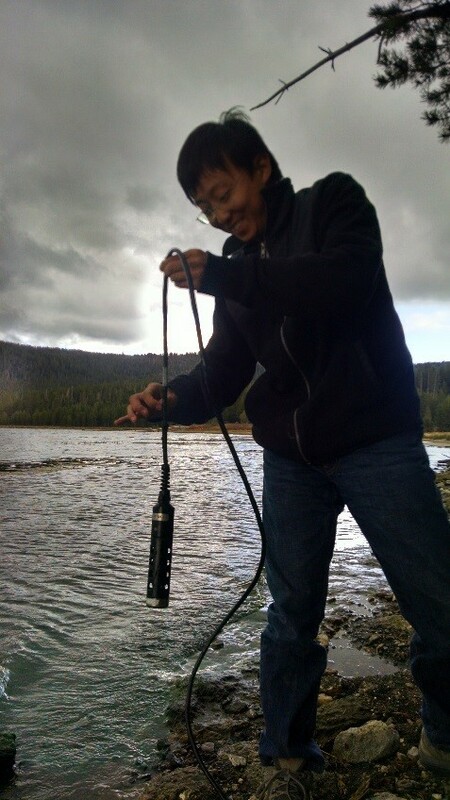 Visiting scientist Ma Feng collects water quality data at East Lake hot springs. Our ongoing groundwater sampling program continues to add to and improve the scientific data available for the area. As part of the sampling program, groundwater was recently collected from seven sites at and around the Newberry EGS Demonstration injection well. Fore more information about the groundwater monitoring program at the Newberry EGS Demonstration, see our previous post on the topic- Groundwater Monitoring and Water Sampling Update. how can I save this information for future reference? Blog posts will be available here well into the future- we don’t delete them. Suddenly Volcano’s erupting all over the world. How can you be sure you are not responsible? Cause and effect. Where are your facts showing what you are doing is not causing these other volcano’s to erupt? For every action there is a reaction. You are drilling into the ring of fire. I would refer you to Karl Popper’s musings on the nature and scope of knowledge. He stresses that the problem of distinguishing truly scientific endeavours from the unscientific is based upon those endeavours as being falsifiable. That is, that which is unfalsifiable is also unscientific, and that postulating an unfalsifiable theory (such as that injecting cold water at low pressures in Oregon could even remotely possibly cause a volcano to erupt in Japan) could be scientifically true is pseudoscience (http://www.the-rathouse.com/2008/Bartley1964CCR.html). Another example is the Russell’s teapot analogy (Russell, 1952; available at http://russell.mcmaster.ca/cpbr11p69.pdf), which demonstrates that the burden of proof for a scientifically unfalsifiable claims lies upon a person making that claim rather than shifting the burden of proof to others.